Beautifully hand knotted in pure New Zealand wool and cotton material. It contains Kashan design pattern. This carpet is a perfect example of Indain Carpets. Centra Chakra Kashan is highly durable carpet and ideal for a living room. This magnificent carpet has Kashan design which is very traditional and originated from Kashan(Persia). 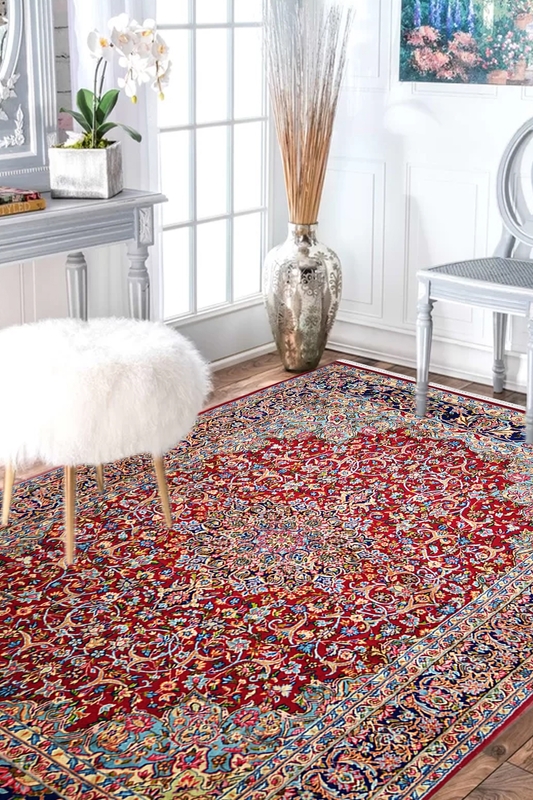 This is the most popular hand knotted rug in the world. It has taken approximately 9 months to weave. It has a rectangular shape in ground and beautiful chandelier shape design in the center. The primary colors are Red and light blue. The center design pattern on the ground is in red tone. This is suitable for living area.